This Wild Blueberry Kefir Smoothie is packed with protein, greens and probiotics and makes a great breakfast or afternoon snack. Allow me to introduce you to Squish’s favorite snack. We’ve been enjoying afternoon smoothies for a while now, but a few weeks ago he finally learned how to drink through a straw and lemme tell you, that was a game changer! When it comes to smoothies, I’m a creature of habit. If I find a combo I like, I stick with it. So I’m not exaggerating when I say that this is the exact smoothie I’ve been making for weeks now. Well pretty much. I never actually measure anything when I make it…but I took some measurements for you guys. Just keep in mind that it’s very forgiving. There’s really no need to bust out the measuring cups. You guys may remember I’ve done some sponsored recipe series with Wild Blueberries the past couple of summers (These Wild Blueberry Energy Bars are one of my favorite recipes!). But this isn’t a sponsored post. I just happen to really love them and they sell a giant bag at Costco that I can’t seem to resist buying. Let’s talk about the other flavors in this smoothie. In my never-ending quest to get my child to eat more veggies, I always through a few Frozen Spinach Cubes into my smoothies. Since I’m not a huge fan of actually drinking green stuff, wild blueberries are perfect for hiding the green color. I also always try to add some healthy fats to my smoothies. In this combo, I chose peanut butter. Blueberry and peanut butter is actually one of my favorite combos ever! As far as liquid, I opted for kefir. I’m sure you guys have heard about the growing popularity of probiotics and fermented foods. I’m trying really hard to get onboard because I’m well aware of the benefits…the problem is a lot of fermented stuff just doesn’t agree with my tastebuds- think sauerkraut, kimchi, etc. But give me this drinkable yogurt-type thing that’s loaded with probiotics and I can handle that in a smoothie! And finally, I threw some whole milk yogurt in there. I usually use a mix of plain and vanilla and alternate between regular and greek based on what I have on hand. If I’m feeling like going a step above and beyond, I’ll throw in some chia or hemp seeds. But that’s pretty much it! Add a little bit of water if needed to reach desired consistency. Ta da! It’s smoothie time. I like mine thick enough to eat with a spoon but I just add a little water to Squish’s to thin it out enough that he can drink it through a straw. Doubling or tripling my smoothie recipe on Sundays and pouring it into ice cube trays to freeze. Then, in the morning during the week, I just put a few smoothie cubes in a glass and stick it in the fridge. By the time snack time rolls around in the afternoon, I just have to pop that glass in the microwave, defrost for 10-15 seconds and BAM! Smoothie is ready. It’s almost fast enough to satisfy Squish…and there’s no clean-up for me! Win win! So there you go friends! I know there are tons of smoothie flavor combos out there but I think this one is worth a try! It’s certainly a big hit in our house! 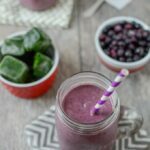 This Wild Blueberry Kefir Smoothie from @leangrnbeanblog is packed with protein, greens and probiotics! Blueberries are my BFF when I’m trying to mask the green from my kids. I make a similar smoothie often except without Kefir. It’s something I don’t buy but I know I should – hello probiotics! Pinning! ooh my girls LOVE kefir – have to make this for them! I’ve been adding kefir to my smoothies a lot lately. It makes it so thick and creamy like a milkshake! love that you used both kefir and yogurt this smoothie! It looks so creamy and delicious! I agree about masking the greens….I think wild blueberries do it better than any other fruit. Totally swiping that frozen spinach cube idea from you. Thanks! I’ve never tried Kefir but I love having another option to get probiotics besides yogurt!! PS I think about doing those spinach cubes all the time but there isn’t enough room where I’m at now. Soon though!! This looks amazing! Will have to try making smoothies with Kefir! Sharing! Love the frozen cub Idea. I make my own Keifer with starter that my son gave me. I usually use frozen berries but now i will add the spinich along with my machta green tea powder. i love the smoothie ice cube idea!!! do they not separate when you defrost them? that’s the problem i have from freezing/defrosting smoothies, but that might be because they’re bigger than ice cube size. 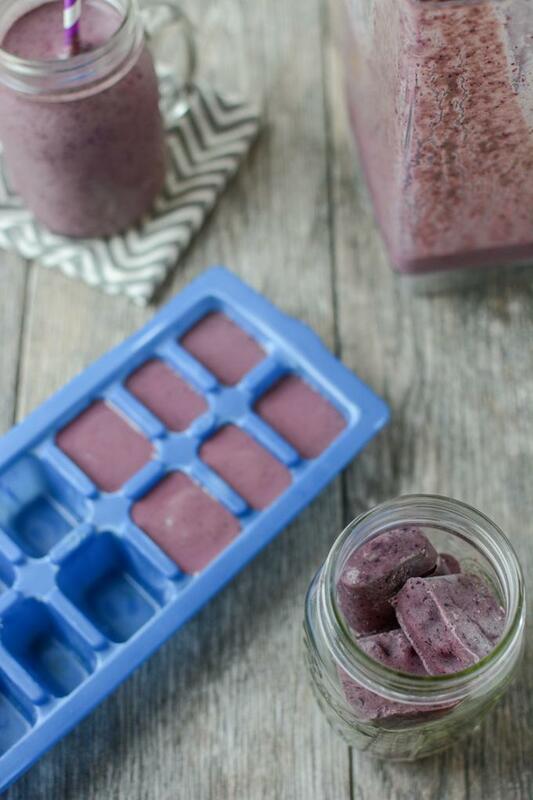 Wow, so organized freezing the smoothie in cubes for your toddler! Kefir is good stuff, more digestible I find than even yogurt. Going to try this with my kids. Thanks!! 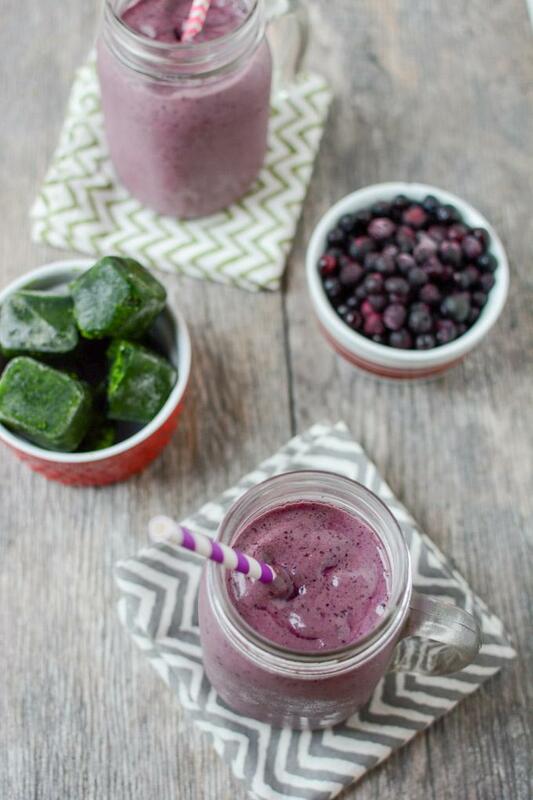 Love the ideas of spinach cubes and this smoothie is absolutely gorgeous Lindsay! 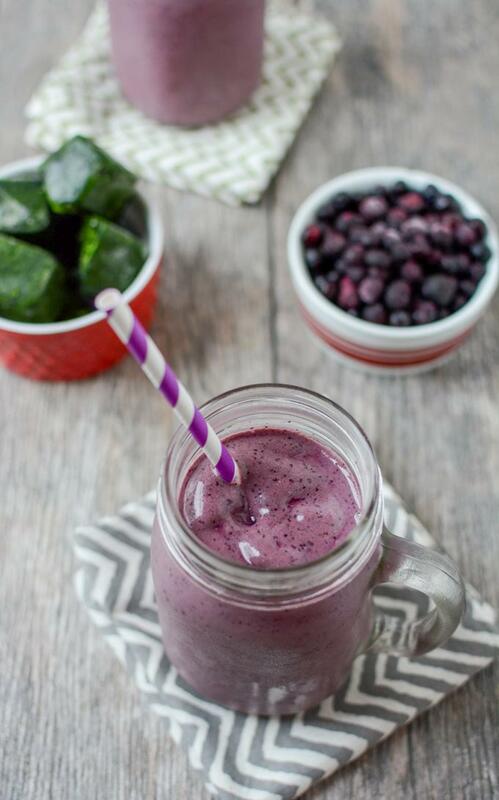 Blueberry smoothies are my favorite! Love the ice cube tray trick too! love the Frozen Spinach Cubes!! what a great idea! I love that you don’t add more sugar to this smoothie! Too many people add maple syrup or honey or just a ton of fruit to their smoothies. 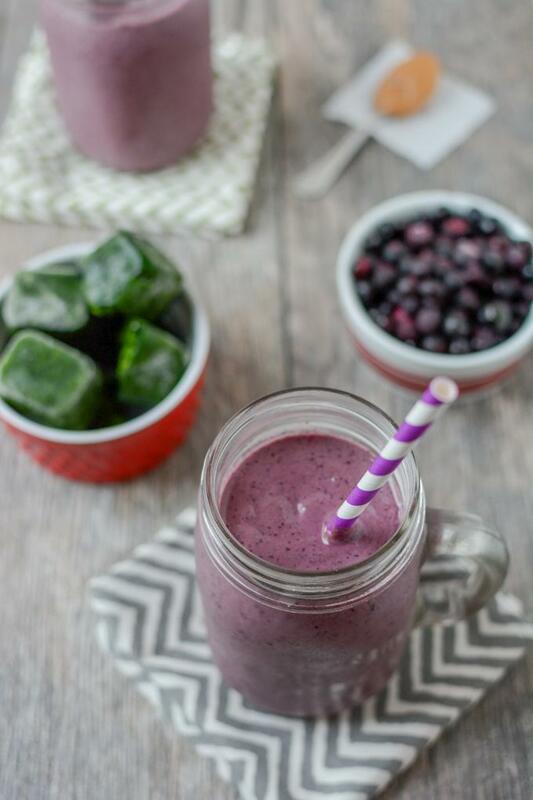 This smoothie is tasty without being sugar loaded! Cheers!